The Maison Nivard-De Saint-Dizier project is not just about digging for artifacts on the museum site. We are also interested in the past environment of the region, and how that affected the way humans used the site. For this portion of the study, our partners in geography, Dr. Gail Chmura (McGill University) and Dr. Florin Pendea (Lakehead University, need to take a good long look at the soil in the area. But not just any soil! The best places to collect samples for reconstructing the paleo-environments are those saturated with water, where pollen, spores, and remnants of past vegetation have accumulated undisturbed and are protected from decomposition. 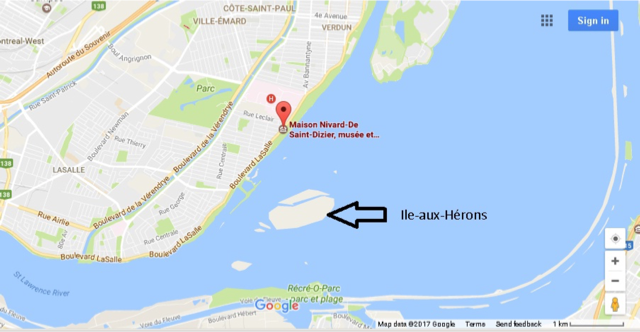 Using satellite images and historical maps, Dr. Pendea and Dr. Chmura determined that the closest place to the Maison Nivard site where they might find the right environment was Île-aux-Hérons. just to the south of Maison Nivard. 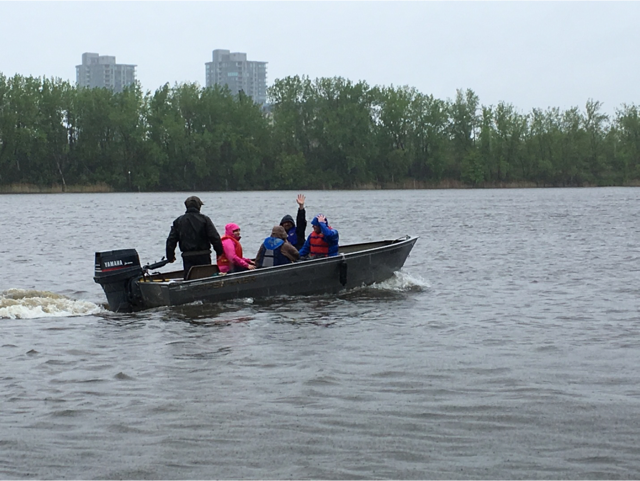 So, on a very wet Friday (May 26th) our intrepid team of geographers headed off to Île-aux-Hérons! The island is mostly a conservation area, and the largest heron nesting ground in North America. Special permission was needed even to set foot on the island! Valérie Aubin, a biologist with Nature Conservancy Canada, arranged the trip and accompanied our team. The island also has summer-homes along its shoreline, and one of the owners, Denis Tessier, gave them a ride from the Verdun Marina. Leaving the Verdun Marina with Mr. Tessier. Dr. Florin Pendea and Lucas Ellison, an Earth Systems Science undergraduate student at McGill, driving the core into the soil in the cattail marsh. 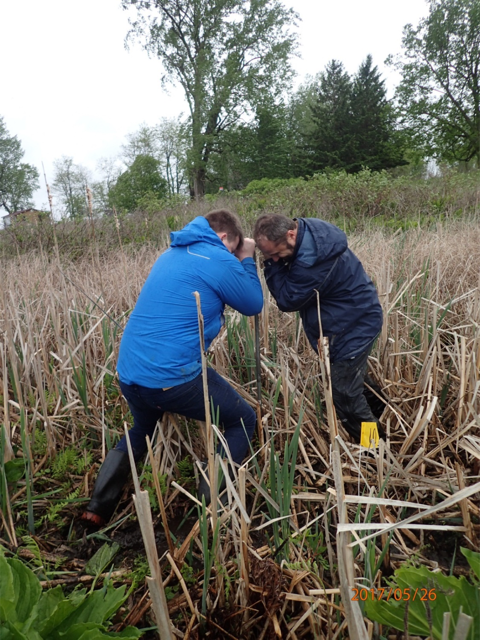 The team trekked across the island and located a marsh with cattail (Typha) and skunk cabbage that had deep wet soil. 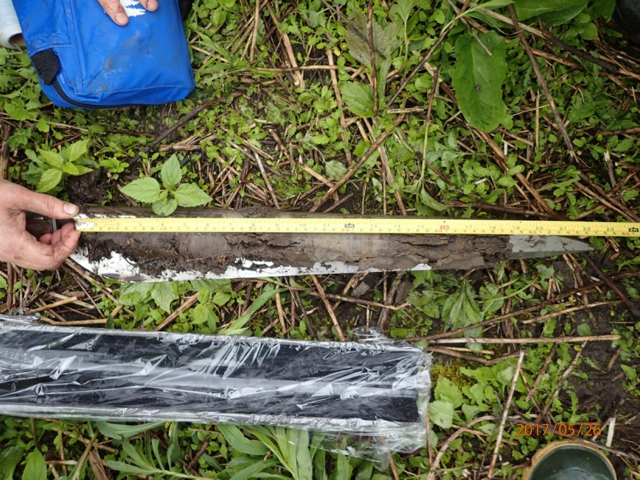 Then, they extracted 50 cm of the soil at a time using an auger (a long metal tube) – as we get deeper in the soil we go further back into the past, so the team worked hard to penetrate through all the soil to the bottom which should correspond to the origin of the marsh. 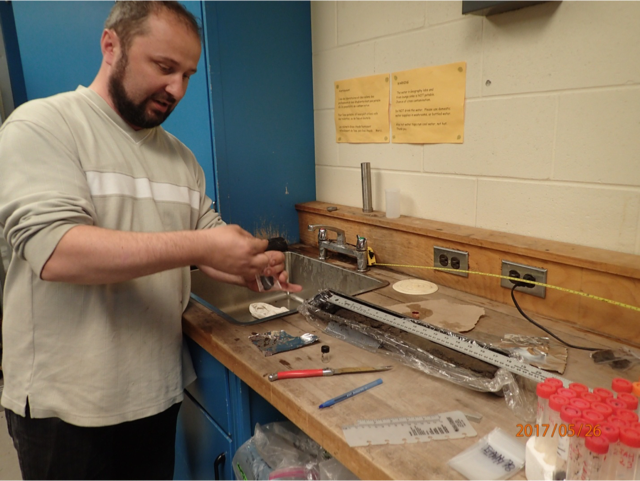 Once the soil was extracted, it was examined in the field, then transported back to the lab at McGill for processing and analysis. Dr. Pendea and Lucas Ellison measure the depth the auger penetrated into the marsh. A close-up view of one of the cored segments shows the difference layers of soil (which we could also call sediment). Next to it is a hard plastic tube used to transport the soil intact, after protecting it with plastic wrap. Once in the lab, the soil was sub-sampled in I 1 cm increments so that the analysts could track changes over time. Dr. Pendea sub-sampling cored soil in the lab. The sub-samples are then processed with chemicals that dissolve the minerals and most of the organic matter, leaving the resistant pollen and spores. The team also will search the soil retrieved from the lowermost depths to find plant material appropriate for carbon-14 dating, hoping to confirm that we have retrieved an environmental record that goes back thousands of years. 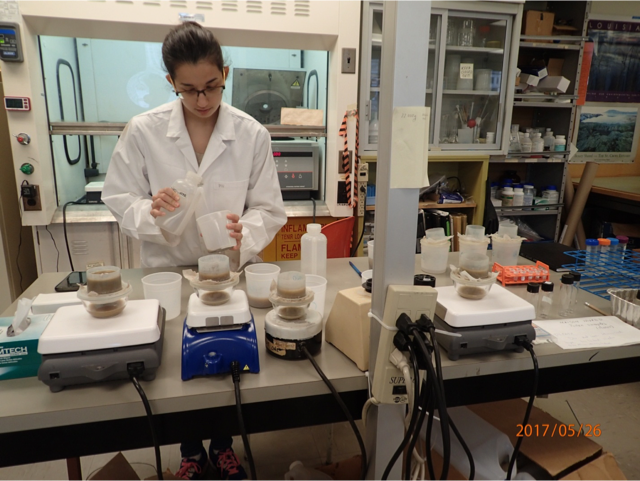 Aleksandra Dragieva , a Biochemistry undergraduate student at McGill, is washing the soil samples through sieves to first remove all the coarse material (such as sand) and then through a very fine sieve that allows us to concentrate particles the size of pollen and spores (10 – 120 µm that is 0.010 to 0.120 millimeters). This helps us reduce that amount of chemicals we have to use when processing continues in the fume hood (which vents any toxic fumes from the lab) behind Aleksandra. The samples will then be mounted on slides for the researchers to examine under the microscope.